U.S. Sen. Cory Gardner of Colorado stumping for Republican Matt Rosedale in Helena, Montana, October 23, 2018. Rosedale is facing two-term incumbent Democrat Jon Tester in what the latest polls indicate is a toss-up race. The head of the National Republican Senatorial Committee, which has spent nearly $5 million to influence the outcome of Montana U.S. Senate race, stumped on behalf of Matt Rosendale in Montana Tuesday during a get-out-the-vote tour. U.S. Sen. Cory Gardner of Colorado joined Rosendale on a three-town swing through western Montana two weeks ahead of election day. Gardner, the chairman of the NRSC, is the latest high-profile Republican to visit Montana in a month that’s also seen stops from Vice President Mike Pence and President Donald Trump. At Rosendale and Gardner’s stop at the GOP office in Helena, they riffed on their support of President Trump's agenda - securing the nation's southern border, supporting his Supreme Court nominees and protecting 2nd Amendment rights. Rosendale stressed the importance of turning out the Republican vote in his race against Democrat Jon Tester. “If we all stick together we’re going to be able to flip this seat from Democrats to Republican control,” Rosendale says. 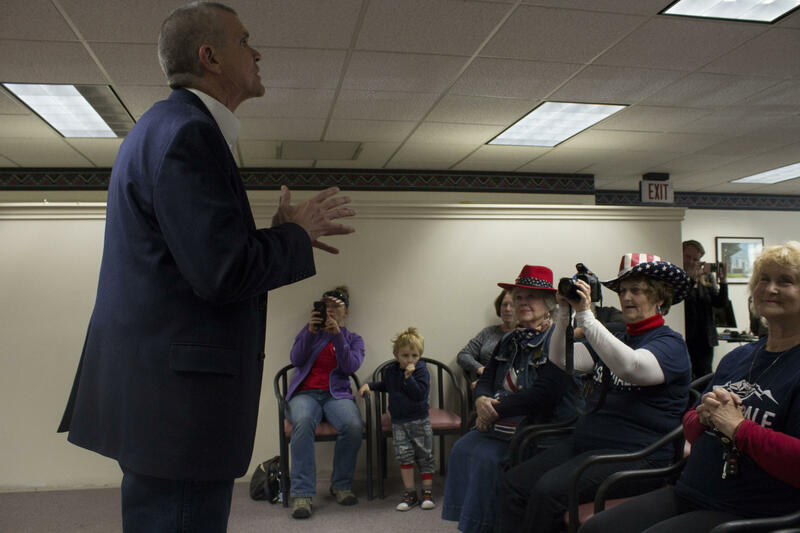 Republican Matt Rosendale speaks with voters at the GOP office in Helena. A poll released Monday from the Montana Television Network and Montana State University shows this year’s Senate race is essentially a toss-up. The poll also showed a significant split in how men and women are expected to vote on election day. It shows Rosendale is up with men over Tester by six points, but that Montana women favor Tester by 13 points. Rosendale and Sen. Gardner did not take questions from the press during their stop in Helena. A member of Rosendale’s staff said they were on a tight schedule to get to their next event. With Montana’s 2018 campaign season into its final month, Sen. Jon Tester and Rep. Greg Gianforte, the two incumbents in the midterm election, have charted clear fundraising advantages over their respective challengers, State Auditor Matt Rosendale and former state legislator Kathleen Williams. On the day President Trump visited Missoula, his third to Montana to stump for Republican Senate-hopeful Matt Rosendale, his Democratic opponent, Sen. Jon Tester, was in Butte with veterans of all political stripes. The ‘Love Trumps Hate’ rally, progressive Missoula’s answer to President Donald Trump’s appearance Thursday, drew roughly 1,500 people to Playfair Park. The rally served as an emotional release for some participants.